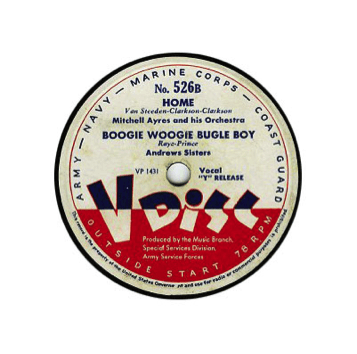 V-Discs are a 12in., double-sided, 78 Record that contained popular songs of the day. They were distributed for free/played to soldiers serving in World War II. The sides of the record were labeled as an A-side and a B-side. Each side contained one song that was about 6 minutes. The extra two inches (as compared to 10in. for a regular 78) allow for more grooves to be cut in the record, thus increasing playing time.